This American dramatist became one of the most popular playwrights of the late 19th century, both in the U.S. and the U.K., with such syrupy affairs as "Saratoga" (1870), "Young Mrs. Winthrop" (1882), "Shenandoah" (1998) and others. ALS, 3pp, 5" X 8" (lettersheet), London, England, 25 October 1881. Addressed to Mrs. Barrow. Near fine. Faint mounting trace along original fold. 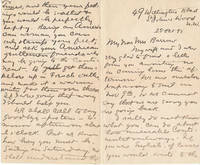 Amusing chatty letter to a fellow expatriate on the verge of sailing back to the States. "I really do not know what you can do about those miserable Continental railways. If you were English, of course you would write to the Times, and then your feelings would be soothed & you would be perfectly happy. Being an American woman, you can only stamp your feet, and ask your American gentlemen friends, who may be going to the Continent, to get themselves up in French oaths, and make it a warm winter for them over there...." Boldly penned in his large and legible script in brown ink. Nice example with interesting Americans-abroad content. This prolific American author of fiction and nonfiction wrote the screenplays for "The Jolson Story," "The Greatest Show on Earth" and other films. TLS, 1p, 8½" X 11", Brooklyn, NY, n.y. [postal cancellation 14 March 1940]. 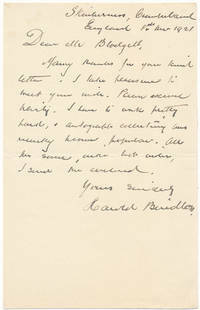 Addressed to Harry W. Zollars. Very good. Faint original folds. Chatty letter to an early admirer "about my novel DECADE. I am happy you enjoyed it and am very pleased that you have added it to your collection, I will of course sign your copy -- send it along. I like to sign people's copies of my books. Trader Horn once told me -- 'An author should always sign as many books as he can find. People never lend signed copies....' I think that is good advice. Besides which, being a collector myself -- I know what a signed copy means on the shelve." About his background, he notes: "I am, as you guessed, starting the '30s, was educated here there and lots of places -- and am now working on another novel to be published late fall or early spring -- said book to be called (if not changed) REPLENISH THE EARTH. Its about the Wall Street people who wrecked the Rowlandson Corps -- and of course The Old One will be on deck....." Born Chauncey Weiner or Wiener (he used both), the book "Decade 1929-1939" was his first book published under the pseudonym Stephen Longstreet. "Replenish the Earth" was apparently never published; it was reported in late 1940 that 20th Century-Fox had purchased the film rights to it, though such a movie was never produced. Boldly signed with his usual long 5½" signature in black ink. Curiously, below his signature he types his address and also "c/o P. Haggard" -- Paul Haggard being another of his several nom-de-plumes. With original envelope. 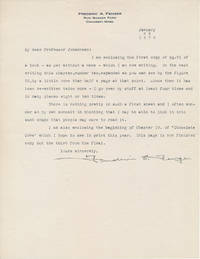 An exceptionally early and typically interesting letter. This Massachusetts journalist founded and edited the influential anti-slavery "Springfield Republican" newspaper from 1844 until his death; he also wrote several popular travelogues such as "Across the Continent" (1865) and "The Switzerland of America" (1869). 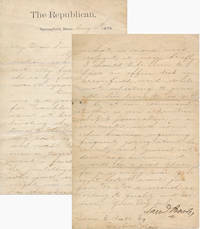 LS, 2pp, 5½" X 8½", Springfield, MA, 4 August 1875. Addressed to James C. Pratt (1832-90, fellow Massachusetts journalist and editor). Good plus. Age toned and edgeworn, with several small and expert archival mends. 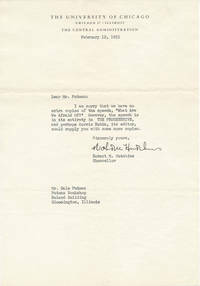 On letterhead of "The Republican," Bowles confirms that "Your recollection was nearly correct. My father died in the early fall of 1852, and was 54 years old" and seeks help in finding a roving reporter: "Can you help me to a good correspondent for Franklin county resident at Greenfield and devoting the full of his time to The Republican going east as far as Athol, and west... once or twice a week? I want a faithful, reliable, intelligent person, who will set down ought in malice, and has the sense to know what is news and report it very briefly. I should like him to have an office desk in Greenfield, and while not expecting to give all his time to us yet to be at our command. Either as an apprenticeship to journalism, or as connected with some other business requiring frequent going about the county and general outdoor acquaintance, it would be a good place for a young man of the right sort. I would give from $30 to $50 a month...." Boldly signed. Interesting look at one of the day-to-day concerns of running a newspaper at the time. This wunderkind of educators had already served as dean of Yale Law School when named president of University of Chicago in 1929! With Mortimer J. Adler, he introduced the famed "Great Books" program, eliminated intercollegiate football and made other radical curriculum changes; he authored many volumes on education issues and served in other influential positions, including president of the Center for the Study of Democratic Institutions, which he founded in 1969. TNS, 1p , 7¼" X 10½", Chicago, IL, 12 February 1951. Addressed to Dale Putnam. Near fine. Original folds. On "The University of Chicago" letterhead, Hutchins tells this Bloomington, Illinois bookshop owner that "I am sorry that we have no extra copies of the speech, 'What Are We Afraid Of?' However, the speech is in its entirety in THE PROGRESSIVE, and perhaps Morris Rubin, its editor, could supply you with some more copies." Boldly signed in full in black ink. With original envelope. Nice example. This Anheuser-Busch heiress penned the popular dog tale "Falko"; her second husband was G. Fred Hummel (1882-1952), a popular Long Island novelist, playwright and historian. 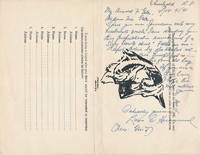 ANS on rear leaf of a 4pp promotional leaflet for "Falko," 8½" X 11", Southold, NY, 4 November 1941. Addressed to Arnold F. Gates (1914-93, noted Lincoln/Civil War scholar). Very good. "Since you are familiar with my husband's novels, I am sending you this prepublication announcement of a story I wrote about 'Falko' our wonderful police dog who traveled all over Europe with us in the good old days. 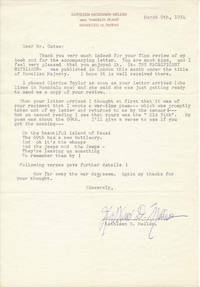 If you are a dog lover, I hope this will interest you...." Boldly signed "Lillie C. Hummel (Mrs. Geo. F.)." Unusual. This South African writer produced bestselling novels, short stories, biographies and essays. ALS, 2pp, 7" X 9", London, England, n.y. [postal cancellation 10 November 1937]. Addressed to Harry W. Zollars. Near fine. Original folds. On imprinted letterhead, Cloete pens an American admirer shortly after the release of his first book, "Turning Wheels," a bestseller that sold more than two million copies and was banned in South Africa. 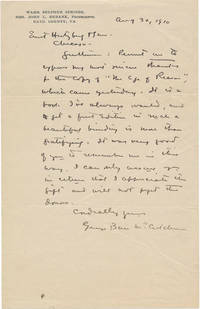 "I suppose no greater compliment can be offered to a writer than the one you have paid me. If I have done nothing else I have given some hours of enjoyment to a great number of people and that surely is the function of a writer. If he or she serves any other purpose I do not know it. Naturally I am delighted to be successful -- It means that I can go on writing as I wish to write...." Superb content about his first success, boldly penned and signed in thick black ink. With original matching envelope, addressed in his hand. This prolific, Pulitzer Prize-nominated American writer penned dozens of highly-regarded, exhaustively-researched works of historical fiction and natural history, high among them the acclaimed 6-volume "Winning of America" series. Bold and handsome "Best Wishes! / Allan W. Eckert" in black fineline on an archival decorative-edged 3½" X 4" bookplate (ungummed), n.p., n.y. Fine. Accompanied by a fine glossy 5" X 7" publicity head-and-shoulders portrait of Eckert issued with the 1992 release of "A Sorrow in Our Heart: The Life of Tecumseh," a fine press release of which is also present. This American historian and diplomat is largely remembered for his 1856 3-volume "History of the Dutch Republic," one of the most lauded of mid-19th century histories. ALS, 2pp (lettersheet), 4½" X 7", Grove Farm, Leatherhead (Surrey, U.K.), 8 September 1867. Addressed to Lord Beauchamp (Frederick Lygon, 6th Earl Beauchamp, 1830-91). Near fine. 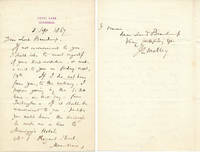 Boldly penned in brown ink on imprinted letterhead, Motley -- who had recently resigned his position as U.S. minister to Austria (in which capacity he helped keep Europe from supporting the Confederacy during the Civil War) -- writes while touring England to arrange a visit with this British Conservative politician. A superb example. This legendary, multi-talented editor around whom the "beautiful people" flocked first became well known in Chicago, where he edited the first newspaper that published signed reviews, the "Chicago Daily News"; he worked for William Randolph Hearst, in 1920 becoming editor of "Harper's Bazaar" and in 1949 editor of "Town & Country"; he was related to William F. "Buffalo Bill" Cody and in 1955 co-authored "Buffalo Bill and the Wild West"; a man of many talents, for a time he ran an advertising agency and was successful and influential in the food processing industry, helping get the U.S. Navy to use processed foods and instrumental in starting up nationwide school lunch programs. ALS, 3pp (separate leaves), Paris, France, 29 May n.y. Addressed to "Sweetheart." Near fine. On letterhead of the "Hotel Plaza-Athenee" in Paris, Sell boldly pens this superb content, life-assessing stream-of consciousness missive in blue ballpoint. Despite printed letterhead at upper left, he adds at upper right "Stormy Paris / Sunny Paris / Quiet Paris / Noisy Paris." He opens with "But Paris!" discussing "my opera tour idea. Ideas travel, like the fella says.... This, for me, is a 'find Sell' tour. The past year (two yrs) has been so full of problems that I just had-a to get away to have a look at my life. Nothing bad, Heavens, it was never 'better.' Everyone and everything has been demonstrating 'give-Henry-a-Boost' week but it all got too much and you, dear Miss Scorpia, know just WHAT I MEAN. So, here I am sleeping and saying 'no thank you' to invitations and walking hours and hours and eating fruit and fish and I bet I will soon find ME (little ole me) and come home for another spell of doing what I can. I feel so lucky that I can do these trips. Makes the difference." And closing with a comment that roughly dates this letter to 1955, the year his book "Buffalo Bill and the Wild West" was published: "did I tell you about Buffalo Bill? Quite a publisher? $7 book. We hope soon to be fighting off movie makers." Signed simply "Love! Henry." An outstanding, fascinating letter perhaps chronicling a mid-life crisis. The grandson of writer and humorist Robert Benchley penned popular thrillers such as "The Deep" and "The Island," but will always be remembered for his first novel, the 1974 smash hit "Jaws" and its record-breaking 1975 film version. 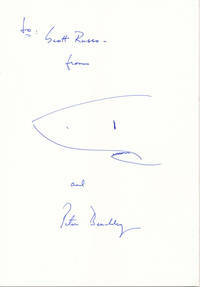 "to: / Scott Russo -- / from / [shark head sketch] / and / Peter Benchley" boldly inscribed and signed in bright blue fineline on a heavy stock glossy 7" X 10" mat board. Near fine. A handsome, pristine example, and exceptionally large -- most often these are penned on index-type cards. This journalist distinguished himself for his coverage of the Civil War for the "Philadelphia Inquirer" and also authored occasional pieces such as the 1863 "History of the Rebel steam ram 'Atlanta.'" Boldly and attractively penned "Your friend / from Time to Eternity / Robt. Stewart Davis" in brown ink on a 5" X 1¼" slip, n.p., n.y. Fine. Famed cartoonist John T. McCutcheon's older brother was a popular and prolific novelist and playwright, by far best known for his "Graustark" novels published between 1901 and 1927 and his bestseller "Brewster's Millions" (1901). ALS, 1p, 5 3/4" X 9", Warm Sulphur Springs, VA, 30 August 1910. Addressed to Ernst Hertzberg & Sons. Near fine. "Permit me to express my most sincere thanks for the copy of 'The Age of Reason,'" McCutcheon pens this long-time Chicago book bindery. "...It is a book I've always wanted, and to get a first edition in such a beautiful binding is more than gratifying. It was very good of you to remember me in this way...." Attractively penned. Thomas Paine's philosophical treatise "The Age of Reason; Being an Investigation of True and Fabulous Theology," published in three parts (1794, 1795, 1807) was a bestseller in its day -- Hertzberg & Sons (today Monastery Hill Bindery) must have appreciated McCutcheon's work enormously to present a lavish custom-bound first edition of this scarce work -- likely as a present on the writer's 44th birthday on July 26th. DS (pencil), 1p, 7" X 9", New York, NY, 12 March 1927. Very good. Two intersecting folds bear expert archival reinforcements on verso; lightly age toned. 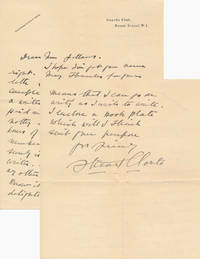 On the verso of an imprinted "Harvard Club / 27 West 44th Street" letterhead, an unknown hand boldly, legibly pencils the headline "Harvard Club -- March 12th 1927" and states: "From the first meeting of the dinner which is annually to honor George P. Baker, we -- the undersigned -- send you this greeting to tell you how much we all miss you. Our deep affection and admiration for you only grows with time. By the beauty of your work and vision you have set us an ideal. We thank you." Below this are two large, full columns of nicely pencilled signatures -- 14 at left, 12 at right. The aforementioned George Pierce Baker (1866-1935) was a legendary drama educator and head of Harvard's English department (1888-1924) who taught that institution's wildly popular, highly-regarded "47 Workshop" playwriting course with such renowned pupils as Eugene O' Neill, Thomas Wolfe, Sidney Howard and Philip Barry. Baker is the first signer in the left column, followed by a "Who's Who" of mostly-Harvard graduates who were movers and shakers in the playwriting world: Maurice Wertheim (1886-1950, theatrical supporter, noted investment banker and famed chess promoter), Everett V. Meeks (1879-1954, founder of Yale's department of architecture), Henry James Forman (1879-1966, author best known for the alarmist 1933 expose "Our Movie Made Children"), George Abbott (1887-1997, playwright, screenwriter, film director, theatrical producer and director), S.N. Behrman (1893-1973, playwright and screenwriter), Sidney Howard (1891-1939, Pulitzer Prize-winning playwright and dramatist, Oscar-winning "Gone With the Wind" screenwriter), Philip Gross (1899-1940, noted drama coach and author), Roscoe W. Brink (?-?, author of 1922 novel "Down the River"), Edgar Scott (1899-1995, playwright and journalist turned investment banker), Donald Mitchell Oenslager (1902-75, famed prolific scenic designer who won the 1959 Tony Award for Best Scenic Design), Stanley R. McCandless (1897-1967, "father of modern lighting design") and Lowell Brentano (1895-1950, author and playwright). Right column: William H. Wells (1901-91, writer), William Gaston (1896-1970, playwright and politician), Edward P. Goodnow (1888-?, playwright, director, actor, producer), Jules Eckert Goodman (1876-1962, playwright), Boyd M. Smith (1888-1973, chairman of Yale's drama department and dean of their school of architecture and design), David Carb (1885-1952, playwright and drama critic who acted with Eugene O'Neill and the Provincetown Players), Walter P. Eaton (1878-1957, drama critic and author), J. Eldon Fillmore (1888-1984, writer and dramatist), Perceval Reniers (1893-1992, author), Lee Simonson (1888-1967, famed stage set designer), Nathaniel W. Stephenson (1867-1935, author known for Lincoln biography and other nonfiction titles) and Edward Knoblock (1874-1945, playwright and screenwriter). 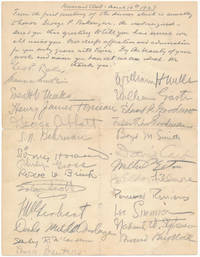 In the left column there is one partly illegible, unidentified signature. Who the recipient was of this expression of "deep affection and admiration" is unknown but intriguing -- most likely a figure of renown in the theatrical world, perhaps elderly and sickly, perhaps crippled and soon-to-be-blind dramatist Edward Sheldon (1886-1946). A remarkable assemblage of figures, in any case, and certainly worth further research. This American playwright sometimes touted as the first to make a living exclusively from playwriting was a Pittsburgh journalist and drama critic whose 1871 play "Through Fire" proved a hit; further plays such as "Peril," "Fate," "Risks," "The Virginian," "The Big Bonanza," "My Partner," "The Galley Slave," "The White Slave" and "Siberia" gained him national attention, though he died in a New York insane asylum. Good content ALS (partial), 1p, 8" X 10", Pittsburgh, PA, n.y. 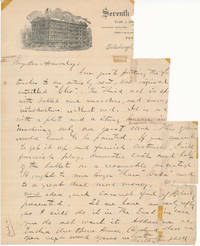 Addressed to "Mr. Haverly (J.K. Haverly, 1837-1901), noted theatrical entrepreneur and blackface minstrel show promoter. Fair only. Paper loss at upper right corner, thus portion of printed letterhead, date and perhaps a half dozen words missing; lightly soiled, with numerous small tape stains (mainly on verso) and neat archival reinforcements on weakened folds (again on verso) -- see website image. Superb content regarding Campbell's latest play, reading in part: "Am just putting the fi[nishing] touches to an entirely new, and original [play] entitled 'Clio'. The third act is sp[ecial] with ballet and marches.... It is a D[rama] with a plot and a strong human in[terest] involving only one great scene. This of course would have to be painted. If you consent to get it up and furnish costumes, I will furnish play, dramatic cast and half of the ballet on a reasonable percentage. It ought to run longer than 'Baba' and to a great deal more money. It is a new idea, and cannot fail, if properly presented. Let me have an early reply, as I will do it in the East in case you do not want it...." Boldly signed at the close, with lengthy initialed postscript on verso which notes among other things that "The cost will include Rosakand and the leading members of the Campbell Comedy Company." It was Haverly who produced Campbell's play "Baba" at his Niblo's Garden Theatre in New York. Despite condition issues, an uncommon autograph of an interesting figure and with excellent meaty contents. This English novelist spent many years in western Canada (a town is named after him in Alberta) and cranked out dozens of popular prairie adventure novels often set in Canada such as "Lorimer of the Northwest" (1909), "Prescott of Saskatchewan" (1913), "The Lure of the North" (1918) and "Northwest!" (1922). AS, 1p, 4½" X 7", Skinverness, Cumberland, England, 1 May 1921. Addressed to Mr. Blodgett. Near fine. Friendly note to admirer, reading in part: "Please excuse brevity. I have to work pretty hard, & autograph collecting has recently become popular...." Boldly penned in brown ink. This American writer authored one bestselling book, the 1917 "Alone in the Caribbean: The Cruise of the 'Yakaboo' in the Lesser Antilles," a nonfiction boating classic, as well as magazine and newspaper stories and articles; a mechanical engineer, he specialized in yacht designs and improvements, some still in use today; he served in the U.S. Navy briefly during World War One and again from 1942 to 1945. TLS, 1p, 8½" X 11", Cohasset, MA, 23 January 1923. Addressed to "Professor Johannsen" -- Albert Johannsen (1871-1962), University of Chicago geology professor and author of "The House of Beadle and Adams and Its Dime and Nickel Novels" (1950), the definitive reference work and bibliography on the subject. Near fine. 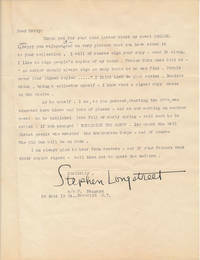 On imprinted letterhead, Fenger offers interesting insight into his writing and revising method. In part: "I am enclosing the first copy of pg. 21 of a book -- as yet without a name -- which I am now writing. In the next writing this chapter, number two, expanded as you can see by the figure 22, by a little more than half a page at that point. Since then it has been re-written twice more -- I go over my stuff at least four times and in many places eight or ten times. There is nothing pretty in such a first sheet and I often wonder at my own conceit in thinking that I may be able to lick it into such shape that people may care to read it...." Huge, bold full signature. The aforementioned "first copy of pg. 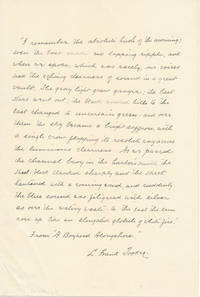 21" is also present, an unsigned Typed Manuscript, 1p, 8½" X 11", n.p., n.d. Double spaced on orange stock, with a few words added, crossed out, circled, etc. Three men up on a bluff overlooking a lake argue what to do about a man in a rowboat who's gone overboard -- melodramatic stuff. A most unusual pair. This American writer authored popular novels in the early 20th century such as "Dr. Ellen" (1908), "Ever After" (1913), "Joanna Builds a Nest" (1920), "Pleasures and Palaces" (1912) and others, including two silent film screenplays. 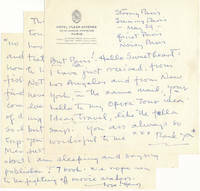 AMS, 1p, 6¼" X 7 3/4", n.p., n.y. Near fine. 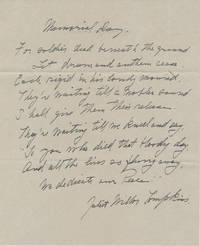 On the verso of her "957 Madison Avenue" New York letterhead, Tompkins pens the 9-line poem "Memorial Day," which opens: "For soldier dead beneath the ground / Let drum and anthem cease...." Boldly signed in full at the conclusion. Undated, but likely penned in the 1920s. From the collection of Albert Johannsen (1871-1962), University of Chicago geology professor and author of "The House of Beadle and Adams and Its Dime and Nickel Novels" (1950), with his original 8½" X 11" file folder, bearing his printed "Collection of Albert Johannsen" label (partly filled in by Johannsen). This lifelong "Century Magazine" assistant editor strongly urged the powers to publish a novel by an unknown author named Joseph Conrad, thus another publisher issued it in 1902; he excelled at maritime writing, his first book being "The Call of the Sea and Other Poems" (1902) and two romantic high seas adventures, "Under Rocking Skies" (1905) and "The Middle Passage" (1920), in addition to the nonfiction "John Paul Jones" (1916) -- all of which he recounts in his memoir "The Joys and Tribulations of an Editor" (1924). AMS, 1p (lettersheet), 5½" X 8¼", n.p., n.y. [lightly pencilled "3-29-23" at lower left in another hand]. Near fine. Tooker handsomely pens a lengthy paragraph from his 1920 "Century Magazine" essay "A Boyhood Alongshore" about growing up on the New England coastline. Evocative sea memories, reading in part: "I remember the absolute hush of the morning; even the boat made no lapping ripple, and when we spoke, which was rarely, our voices had the echoing clearness of sound in a great vault... As we passed the channel buoy in the harbor's mouth the sheet-block clanked sharply and the sheet tautened with a coming wind...." From the collection of Albert Johannsen (1871-1962), University of Chicago geology professor and author of "The House of Beadle and Adams and Its Dime and Nickel Novels" (1950), with his original 8½" X 11" file folder, bearing his printed "Collection of Albert Johannsen" label (partly filled in by Johannsen). This U.S. Marine served with distinction during World War One as well as in Cuba and China, later assigned to Admiral Chester Nimitz's staff during World War Two, but he's largely remembered as an author who often illustrated his own books -- "Fix Bayonets" (short stories, 1926), "Jeb Stuart" (1930), "Salt Winds and Gobi Dust" (short stories, 1934), "Gone to Texas" (novel, 1937), "Lone Star Preacher" (novel, 1941), "--and a Few Marines" (short stories,1943) and others. ALS, 1p. 8½" X 11", Washington, DC, 5 March 1941. Addressed to Arnold F. Gates (1914-93, future notable Lincoln/Civil War scholar). Near fine. 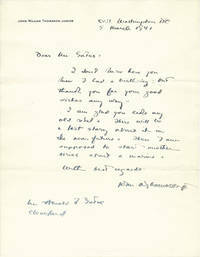 On his imprinted letterhead, Thomason thanks an adirer for birthday wishes, adding, "I am glad you like my old rebel. There will be a last story about it in the near future. Then I am supposed to start another series about a marine...." Boldly penned in blue ink in Thomason's fluid script. The "old rebel" likely refers to his 1930 biography Jeb Stuart" and "another series about a marine" to his 1943 "--and a Few Marines." Nice content and rather uncommon. The "Grand Dame of Hawaiian Literature" produced such books as "In a Hawaiian Valley" (1947), "The Lonely Warrior: The Life and Times of Kamehameha the Great of Hawaii" (1949), "The Magnificent Matriarch: Kaahumanu Queen of Hawaii" (1952), "The Gods Depart: A Saga of the Hawaiian Kingdom" (1956), "An Island Kingdom Passes: Hawaii Becomes American" (1958) and "Hawaiian Heritage: A Brief Illustrated History" (1963). Nice content TLS, 1p, 7¼" X 10½", Honolulu, HI, 9 March 1954. Addressed to Arnold F. Gates (1914-93, noted Lincoln/Civil War scholar). Near fine. On her imprinted letterhead, Mellen send this book reviewer thanks "for your fine review of my book... You are most kind, and I feel very pleased that you enjoyed it. It -- THE MAGNIFICENT MATRIARCH -- was published in London this month under the title of Hawaiian Majesty...." Gates had been stationed in Hawaii for a time during World War Two, which prompts Mellen to add: "When your letter arrived I thought at first that it was of your regiment that I wrote a war-time poem... but on second reading I see that yours was the 'Old 54th'. My poem was about the 69th. I'll give a verse to see if you get the meaning...." and she quotes a 4-line stanza. Signed boldly in blue ballpoint.